If you like the outdoors but also want to keep an eye on your budget, you sure need tools and equipment that manage to help you, without empty your pockets. What’s the story with the solar lanterns? The solar lantern, aka solar lamp, aka solar light, is in fact a lighting system that consists of a LED lamp, solar panels, battery and a charge controller. Some models may also include an inverter, for more versatility. The principle behind a solar lantern is that it operates on electricity from batteries, charged with the help from the solar photovoltaic panel. Why use a solar lantern? As it uses renewable energy, a solar lantern is a lot cheaper than any other standard lamps. It’s safe to use and has minor risk for your health. There are some downsides when getting a solar lantern though. Apart from the initial cost that may surprise you in some cases (the more you pay, the more you get from the model you’ve chosen), a solar lantern depends a lot on the weather. Solar lanterns are easy to install and to use. You don’t have to take care of them that much and they do lower your electricity bills. They stand out as a healthy option, with little to none risk for pollution indoors. The market gives you plenty of models so it’s your wallet and needs that may have the final word when making the final call. 1). Going shopping with just a few bucks is not picnic, but this doesn’t mean you have to go back home with nothing in your bag. You can definitely give it a go with the LEAGY LED Solar Mission Lantern, Vintage Solar Powered that is quite a nice surprise, especially considering its price. The solar lantern gives 10 lumen output and makes it as a pretty decorative addition to any outdoor set. It presents a candle design that warms up any scenery. It features a light sensor so it lights up automatically when it gets dark. It also automatically turns off once the dawn is there. The amorphous solar cell works even if it’s not too sunny for recharging so you don’t need a very bright sunny day for the lantern to power up. The lights run up for almost 6 hours on a full charge. Another thing we like on the lantern is the hanging clip and loop that make the lantern easy to display, but also to store and to carry around. The twinkling candle effect is nice and the lantern comes with so many good things. Its steel hand it easy to fix or to move and the special internal frosted casing and lens casing ensure good dispersion of led. 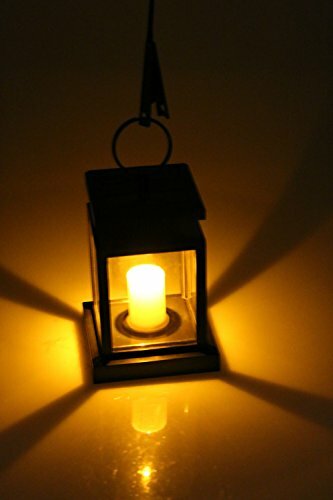 Small, weatherproof, convenient and cheap, the lantern is well made and great to take in your garden/pool or on the porch. As long as you’re able to focus on the good things- they’re so many- it’s impossible not to keep this one in mind, especially if only have a few bucks on you. 2). 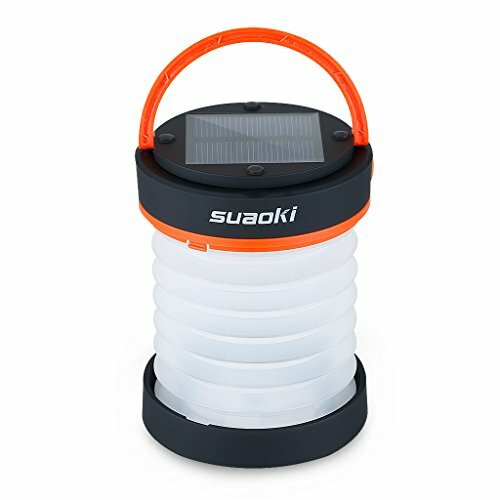 Small, yet bright and pretty reliable in many outdoor situations, the Suaoki Led Camping Lantern Lights Rechargeable Battery (Powered by Solar Panel and USB Charging) is one option that fits any small budget. The lantern comes with a long list of features and its main attraction may be the fact that it uses both solar power and USB. This means you can charge it directly from the sun or use a micro USB port if it’s too cloudy. Important note: you may also use the USB port for charging your phone, which is so important nowadays! The lantern is small and very easy to carry around. It’s easy to fold, which increases its storage and portability. You may adjust it to a tight space and you can fold it down completely when in need for more space in your backpack. The list of good features also includes the three lighting modes: high, low or SOS blinking. This means you get to use the right light for a specific situation, without wasting the power. A Smart Protection Chip makes sure the lantern doesn’t overcharge nor over-circuit, which makes the use so safe. The chip also minimizes risk for over-discharging. The accordion-shape of the lantern gives you in fact two functional forms. You may use it expanded, as a regular lantern, or compressed into a puck-like shape. The lantern is quite bright and lightweight, making it as a great addition to your equipment when camping or hiking. Nevertheless, for the money you pay, you get a versatile, reliable and easy to use solar lantern that takes so little space in any backpack. 3). Are you looking for improving the appearance of your porch? 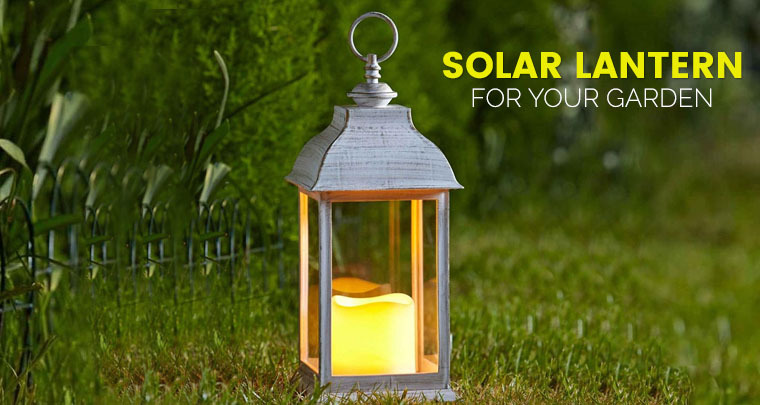 Don’t hesitate and give it a go with the Smart Solar 3960KR1 San Rafael II Solar Mission Lantern, since you won’t be paying that much money after all. The best thing about the solar lantern is its elegant design that gives a nice, classic vibe to any décor. The lantern is made with poly that handles weather challenges and seeded glass effect, for better impression. We also like the stability of the lantern that sits nicely on any surface. It also includes a loop, so you may also hang it if that fits you better. The lantern is lit by 2 high performance LEDs that are placed in the top. They give a nice, warm, white light that is bright enough for an evening on the porch. The lantern has just the right size so it’s not difficult to find its place. The pillar candle inside lantern includes 1 amber LED that warms the glowing effect. The build-in mono crystalline solar panel is reliable and efficient. 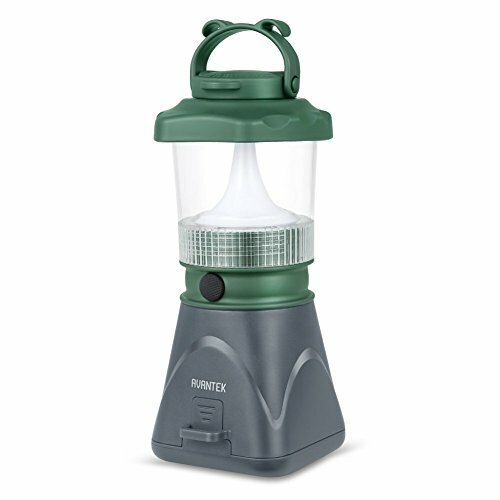 The lantern is easy to use and it automatically turns on at dusk and off at dawn. You don’t need any wiring for the lantern. You simply install it and relax. The solar lantern also includes Ni-Mh batteries that are easy to replace and to recharge. Lightweight, easy to use and looking so nice on any porch, the solar lantern is great to have for warming up an evening on your porch. Nevertheless, for a very good price, you get a solar lantern that not only gives a warm light, but also looks so nice. 4). Nice and giving a soothing light, the Outdoor Black Solar Candle Lanterns are a nice addition to any decor, indoor or outdoor. 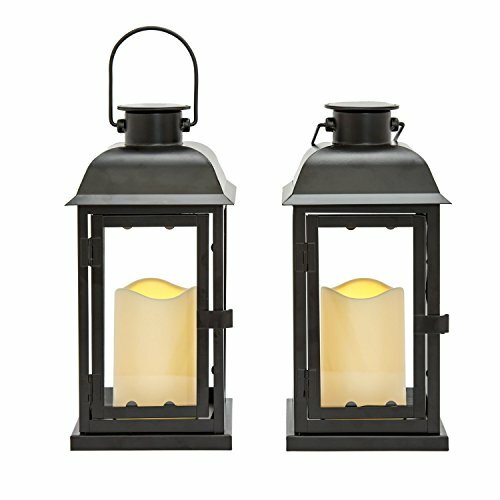 The set includes 2 black solar lanterns with 1 resin candle inside. The Leds provide a warm, white light as they flicker softly inside each lantern. Each lantern comes with one 1.2V AA 600mAh Ni-Mh battery that is easy to recharge when in need. Even though they are designed for the outdoors, you may confidently use them for the indoors. The lanterns are well made and don’t look cheap. The candles are screwed down to open the holes in the bottom. They have the right weight and give a good amount of light. They are made of metal and tall, improving any décor set. Either you want to use them for a romantic evening or simply to warm up the atmosphere on your porch; the lanterns are a good solar option for many. Regardless the inherent flaws, we like the lanterns for their looks and nice light. 5). If you’re looking for a solid solar lantern, you may put your money at stake with a lantern like the AVANTEK Solar LED Camping Lantern with Detachable Solar Panel. The lantern uses a solar panel and comes with built-in rechargeable batteries. We really like the versatility of the lantern as you may charge it by using the 5V DC cord from direct current or the solar panels- as long as they charge from the sunlight. We also like the adjustability of brightness and you may use the low light (40 lumens) or the high light (80 lumens). The lantern used 24 Leds and provides 6 hours of continuous high light. If you’re using the low light, it may work for even 12 hours straight. Another thing that makes the lantern so practical is the fact it’s detachable& portable so you may easier store it. The solar panels are compact, lightweight and very easy to carry around. We also have to mention the rotating hook on the lantern that allows you to hang it where you need. The 360-degree illumination creates a nice light in any tent, giving light in all directions. This is why the lantern is so dependable on outdoor activities or emergencies. Let’s not forget the rainproof design of the lantern, which means it, can take a few splashes. It has an IPX-4 grade that means you can use it on light rain or moist environments. Easy to charge and versatile in so many ways, the solar lantern is a great addition to any hiker’s equipment. For the versatility, rugged build and good light, the solar lantern still stands out as a dependable option when spending a lot of time outdoors.